The official announcement of the Samsung N7100 Galaxy Note II is just a couple of weeks away now, but only now we see what the new phoneblet might actually look like. We just got an alleged photo of the upcoming device, which reveals its front panel. Along with the link to the alleged Samsung Galaxy Note II photo, our tipster also sent us some of the specs of the phoneblet. As expected, the 1280 x 800 pixel Super AMOLED screen will measure 5.5" and will utilize a regular RGB matrix. As for those FullHD screen rumors - according to the tip, it did indeed undergo testing, but it was found to be putting too much strain on the battery to make it to the final device. The chipset inside was once again tipped to be Exynos 4 Quad, with quad-core CPU clocked at 1.5GHz. while the camera will use the same 8MP sensor as the Galaxy S III. The Jelly Bean update for the Galaxy Note II is still being developed, so it's likely that the hybrid droid will launch with Android 4.0 ICS. There is an outside chance that Jelly Bean will be ready in time for the announcement, but it's more likely to come out later on. Finally, some good news for the Galaxy S III users out there. 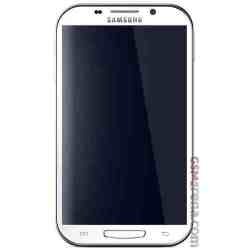 The Jelly Bean update for the flagship smartphone is almost ready and will be released alongside the Galaxy Note II at the Samsung press conference on August 29.